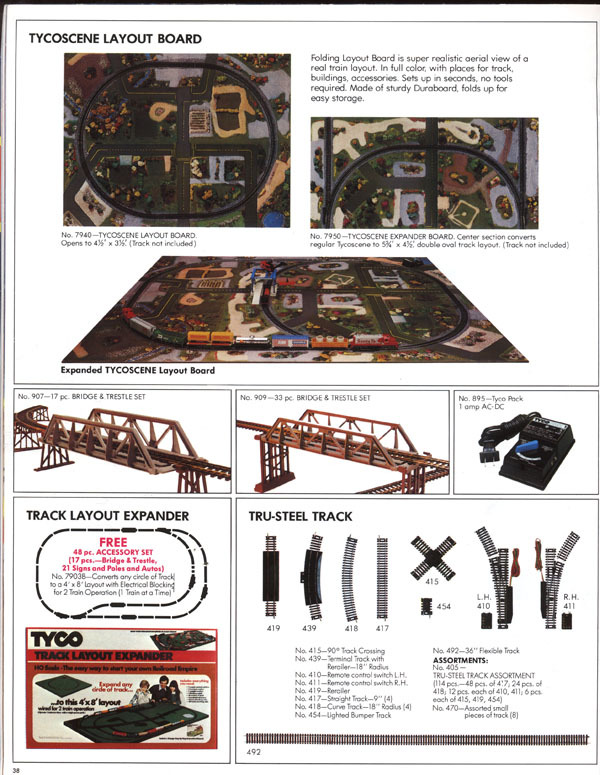 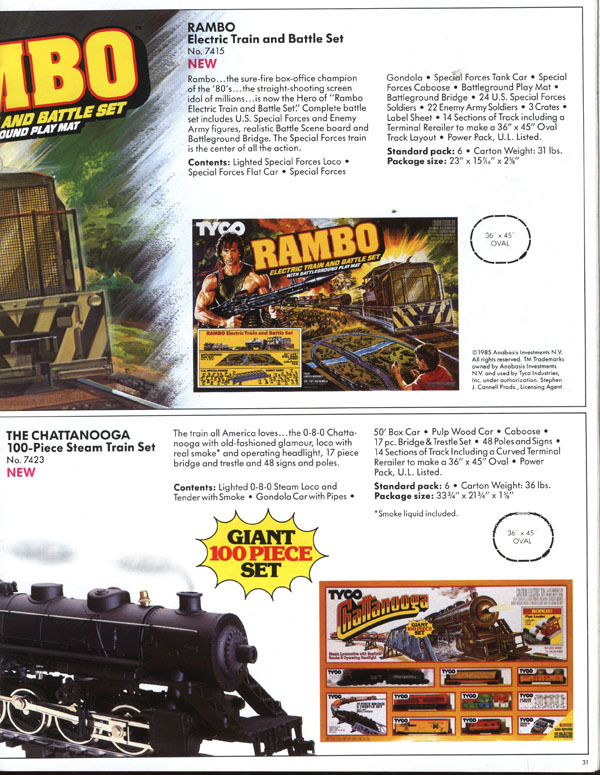 TYCO's 1986 Catalog is another rough year for model railroad fans with the train line not appearing until page 26. 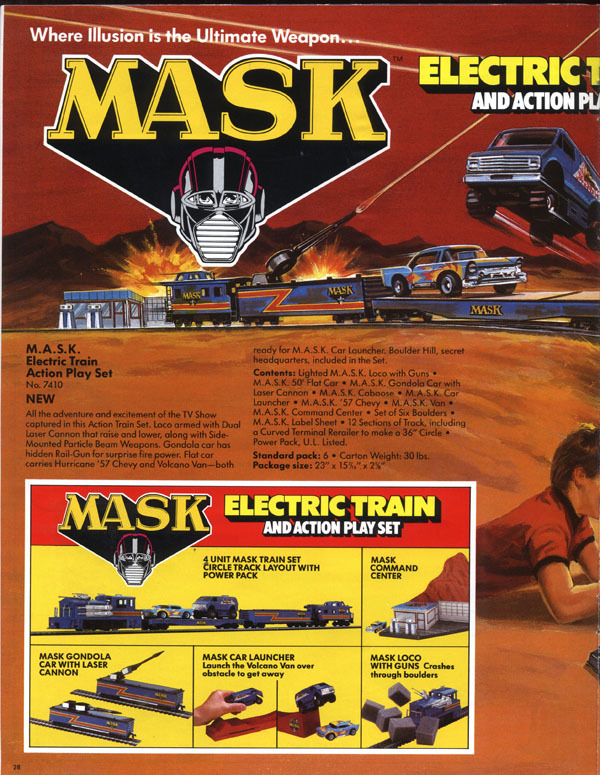 The TV and movie licensed sets continue with "MASK," "Rambo," and "Transformers." 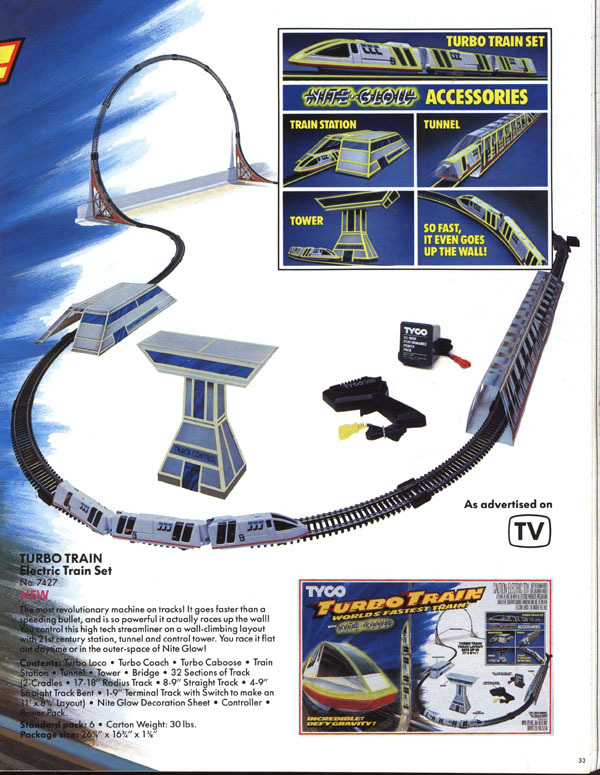 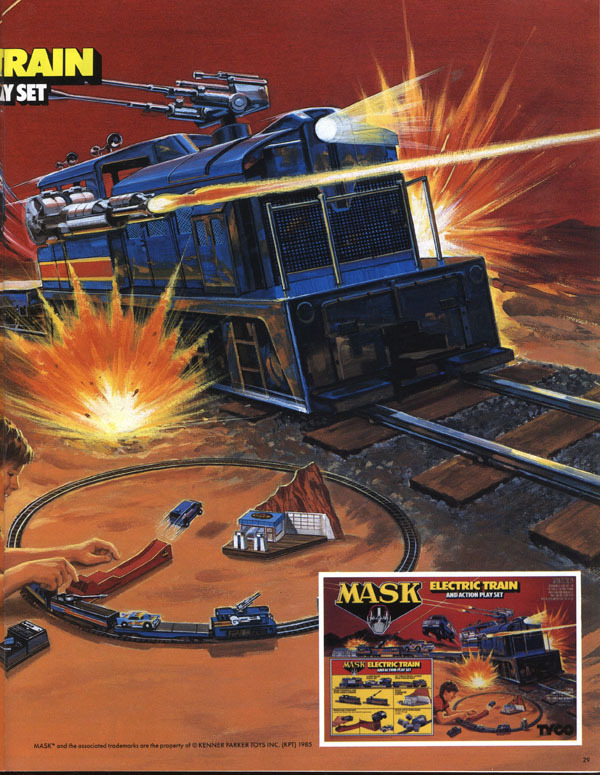 TYCO's Turbo Train debuts in 1986. 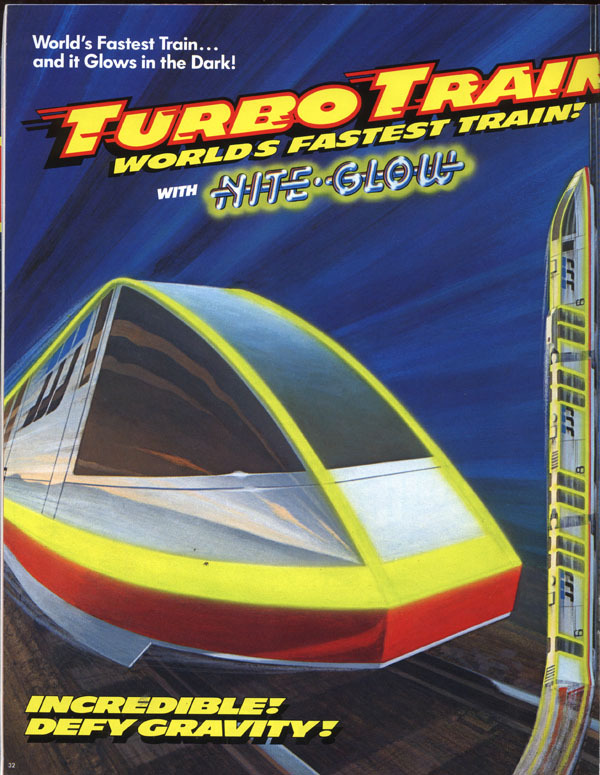 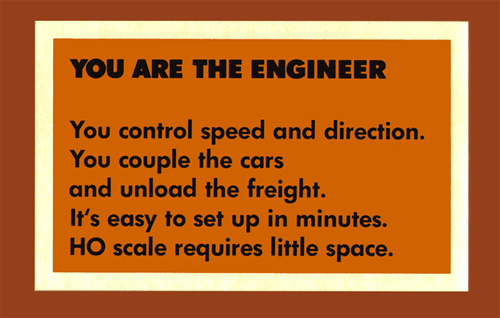 The Turbo Train line would expand during the remaining years TYCO participated in the HO-scale model train market. 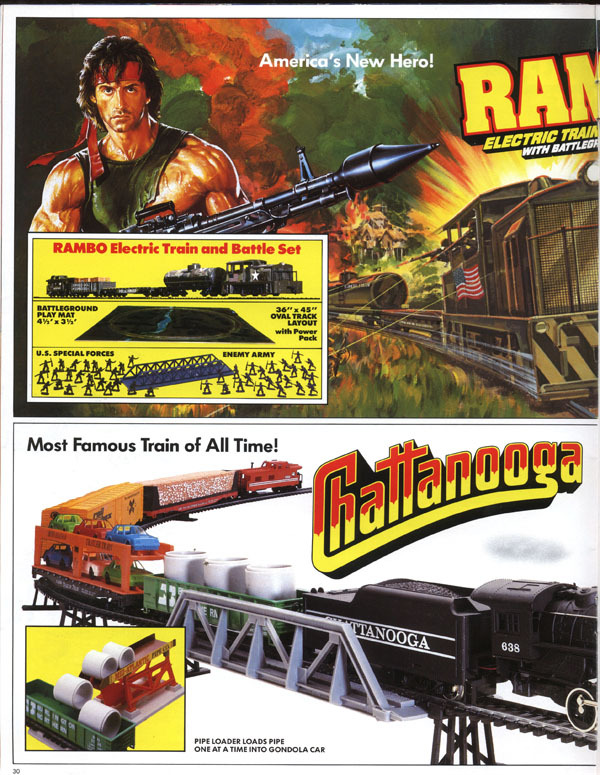 Train sets for 1986 include Rock Island Express (#7403) with Shark Nose power, Long Hauler (#7407) with a Virginian Century 430, the TV show-inspired MASK (#7410) with a Diesel Switcher dressed up, Rambo (#7415) again with Diesel Switcher, Chattanooga (#7423) with an 0-8-0 steamer, Turbo Train (#7427), another TV show-inspired set Transformers (#7430) powered by a disguised Diesel Switcher, and Railroad Empire (#7429) with a Super 630 and many accessories included. 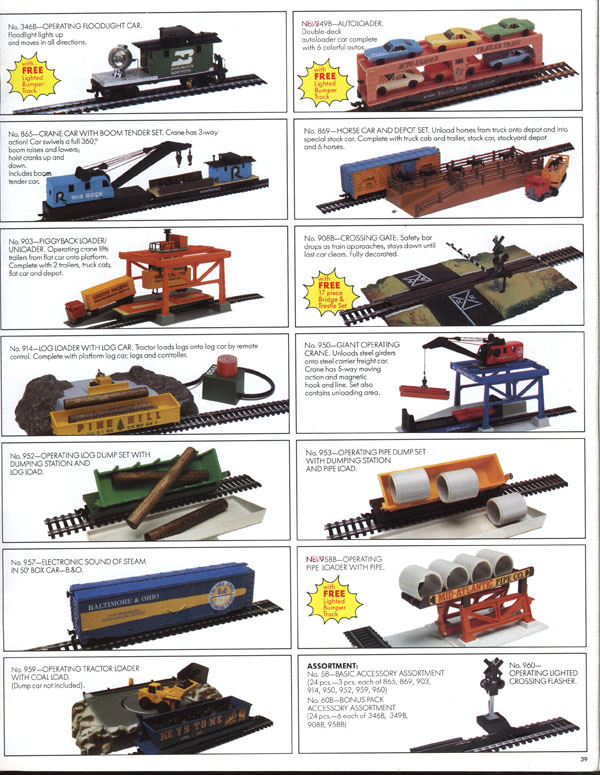 Though it is apparent that TYCO is reducing its train line, 1986 does see the introduction of the Contemporary ,Series of TYCOKITS. 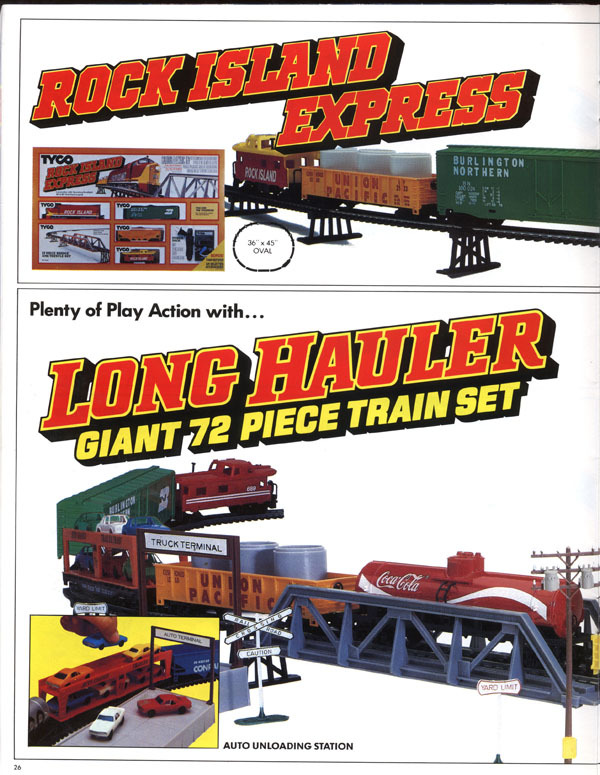 This set launches with a Pizza Hut, Burger King, 7-Eleven, and 7-UP Plant. 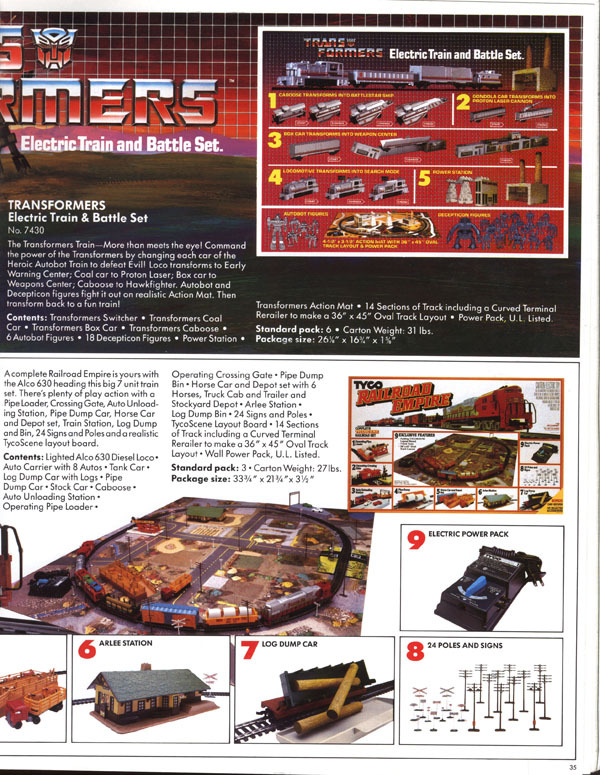 TYCO's Center Street series of TYCOKITS remains with its eight offerings from the year prior. 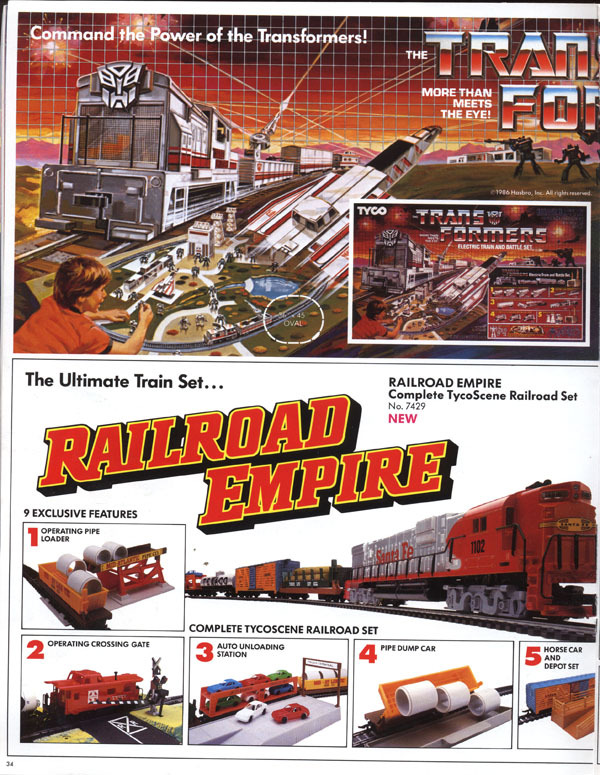 The regular line of TYCOKITS is down to 11 items. 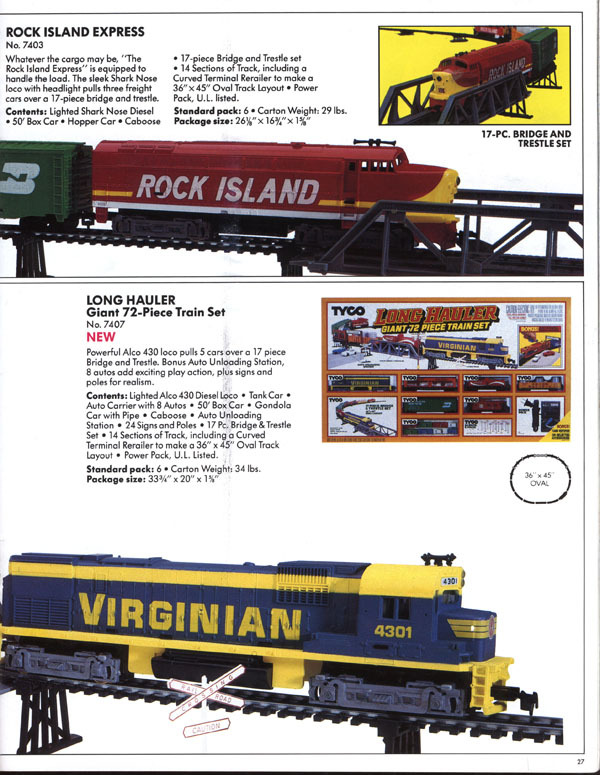 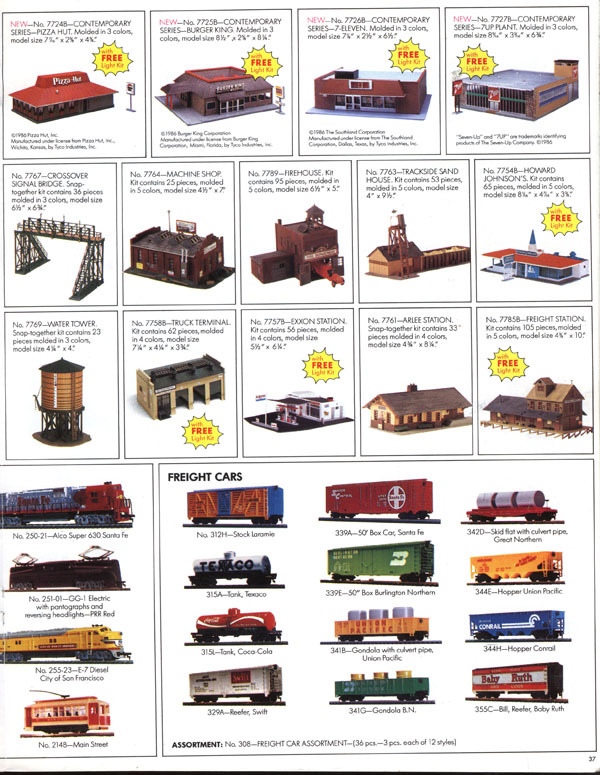 The company's steam locomotives, diesel locomotives, and freight cars remain the same group shown in the 1985 catalog. 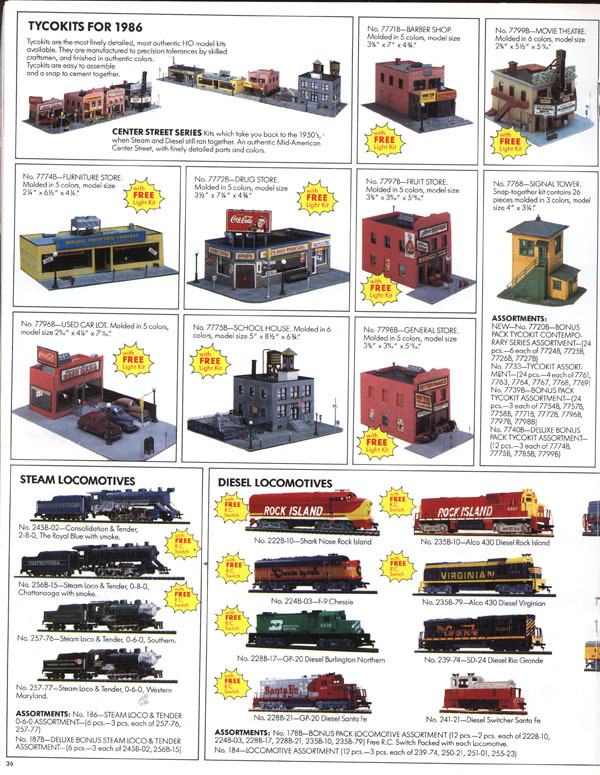 TYCO illustrates its 1986 catalog with a single roadname per item, with few exceptions. 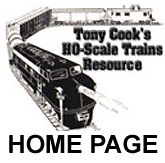 This is the final year to find TYCO's SD24, Diesel Switcher, GG1, E7, and Trolley among the diesel locomotives.